A previously confiscated elongated tortoise photographed just after its release back into the wild in Cambodia's Eastern Plains Landscape. The elongated tortoise is the most commonly confiscated turtle and tortoise species in the Eastern Plains Landscape of Cambodia’s Mondulkiri province. These terrestrial reptiles are highly distinctive with their elongated shells and inhabit forests in South and Southeast Asia. In Cambodia, they have been recorded in the eastern and southwestern Mekong Plains as well as in the Cardamom Mountains. 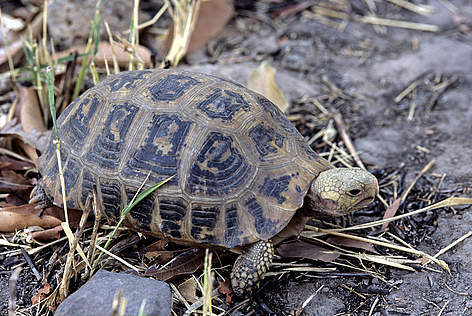 Elongated tortoises are under intense pressure due to over-harvest for food and the pet trade. WWF-led enforcement teams are trying hard to reduce collection pressure on these endangered animals in the dry forests of Cambodia’s Eastern Plains Landscape. Cambodia’s wetlands are home to other threatened turtle species as well, such as the endangered yellow-headed temple turtle (Heosemys annandalii) that was encountered on a recent WWF-led survey of the Mekong mainstream north of Kratie, as well as the critically endangered four-toed terrapin (Batagur baska). This national reptile of Cambodia was originally thought extinct in the country until a population was rediscovered in Koh Kong province in 1995. A protection and captive hatching program is now underway to save this tiny remnant population.